Take Your Protein Pills and Put Your Helmet on: The Flying Humanoids and Liminality. I find something ineffably creepy about the recent flying humanoid videos. The much circulated youtube Mexican flying witch video was the stuff of my nightmares. Hoax or “real,” whoever or whatever is responsible for that image of the seated, dark figure, complete with pointy hat and cape, cruising smoothly through the air as if in a living fairy tale—really knows how to play on an archetypal element. 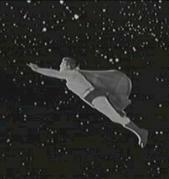 "He looked like Superman and was flying slowly at about 100 yards from the ground in a standing position. He didn't make any smoke or sound. Just cruising around…"
What happens next? I dare say that unrestrained freaking out has never been so warranted and that there has never been a better time for exploring what is happening now, when Superman flies over your house. But why do these stories and images strike me as so deeply bizarre and horrifying? It’s not like people-flyers are unprecedented within our written records and lore. Standard religion is full of flying humanoids with angels, cherubs, and even certain images of Christian religious figures, including Jesus himself. There are several newspaper and historically documented accounts of strange flying humanoids. An 1806 account of thousands of blinding white, flying humanoids at Chimney Mountain was notarized by a court officer per witnesses, and subsequently reported in the North Carolina newspapers The Raleigh Register, and State Gazette. There are mythological examples of Daedalus and Icarus, and scores of recent contemporary examples with Superman, The Flying Nun, The Matrix’s Neo, and on and on. We have ‘flying dreams’ and we even actually can fly now, albeit with vehicular assistance. But, flying for humanoids is truly reserved as a superpower. It seems to be within our psychic comfort zone of desire somehow though, and magical. Unassisted bodily flight is still within that realm--the possible, opposed to the actual. Perhaps we belong, or are destined to be firmly rooted on the earth, despite our aspirations. We do notoriously still lack those jet packs of our would-have-been future. But what exactly accounts for the creepiness of the new videos? Watching Superman the character, Neo, or the many other fictionalized accounts are hardly creepy, in fact, most flying humanoids are classic Heroes. I would imagine that there would even be some great desensitization with these images we have all grown up with. However, I get a sense that there is an ironically opposite effect involved here. Flying humanoids have an innate fictional quality; flyers undeniably belong exclusively to the world of the Fantastic, whether it be religious, magical, mythological, or pop-fictional. Even the ‘real’ accounts of human flyers and levitators (witches, saints, yogis, the possessed, etc.) are dubious and carry an aura of exaggeration, and incredibility. Therefore, to take this powerful mythos out of its fixed, home realm, transplanting it into our mundane daily world, that we can easily identify with as in the videos--of cheap cell phone cameras, birthday parties, ambulances, and police officers—has the effect of worlds colliding. The extreme creepiness factor these videos invoke in me may be the body and mind reacting while it is placed in this liminal world between the common and magical. If this is the case, exploring this mind state while it is invoked is probably warranted. Although these flying humanoid videos may not affect everyone with the same feeling they do me, it’s my experience that most people have their own ‘creepy’ or disturbing thing that hits a little harder than others. Rather than ignoring it or pushing it to the psychic backburner, I suggest that meditating within our tangible reaction to the liminal may prepare us for dealing with life’s extraordinary experiences. Large experiences such as births, deaths, accidents; as well as smaller ones such as panic attacks, dreams, indecisions, minor injuries, etc. can carry an alarming or overwhelming sense of hyperreality that can be exhilarating, disorientating, paralyzing and terrifying, sometimes all at once. Becoming familiar with dealing with liminal psychic states may help us to deal with life in general, and perhaps even further than this, in the afterlife.